The monastery of St. Nicolas of Filanthropinoi is at the island of Pamvotis lake. Next to the entrance you can see well-preserved cells and ruins of other buildings. The church is of on space with an arched roof. It was built by Michael Filanthropinos in the year 1272. It is wallpainted with exceptional mural of 1542 painted with care by Ioasaf Filanthropinos. In the shape of “Π” around the walls of church there are wallpaintings of 1560. It is distinguished for its value the wallpainting of the 7 wisemen of Greece, which is rare for the orthodox church (during the period when the monastery was open, the ancient greek language was taught in it). It is also called monastery of Spanos because there taught the Master Spanos. 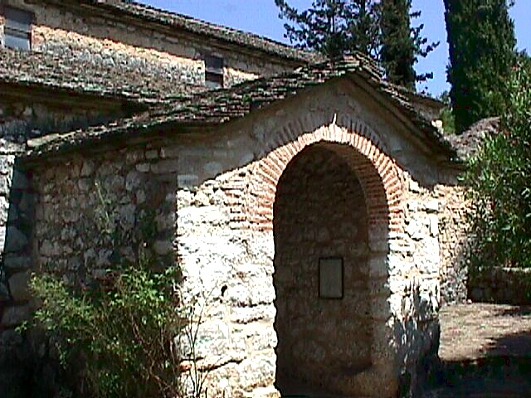 During the period of the despotate of Epirus and after of Ali Passia, it was the most important Religious and Cultural centre.